The offer was irresistible: meet in the pits at the Ocean Speedway in Watsonville and take 8 laps in the #15 American Stocks race car during one of the preliminary heats. Are you serious, I thought to myself. I’ve been a fan of auto racing for years. Lots of exciting times spent at big road tracks like Laguna Seca and Sonoma Raceway (Sears Point back in the day) and at some short dirt ovals like San Jose Fairgrounds and Baylands in Fremont. And these days, I never miss a Formula 1 race. So my response was an enthusiastic Yes! The idea was of course, to bring my camera and in a photo-journalistic style capture the flavor and appeal of this hugely popular sport. A lot of the appeal of this racing has to do with the fact that the all the drivers and their backers are local residents and businesses. So while there’s nobody driving named Jimmie Johnson, Kyle Busch or Dale Earnhart Jr., the fans are rooting for drivers that hail from Watsonville, Aptos, Santa Cruz, Prunedale, Morgan Hill, Gilroy, San Martin, Hollister and Los Banos. Of course, the racing is thrilling with the sprint cars and IMCA (International Motor Contest Assoc.) modifieds providing a double-dose of high-speed (75-110 mph) action on the ¼ mile dirt oval track. 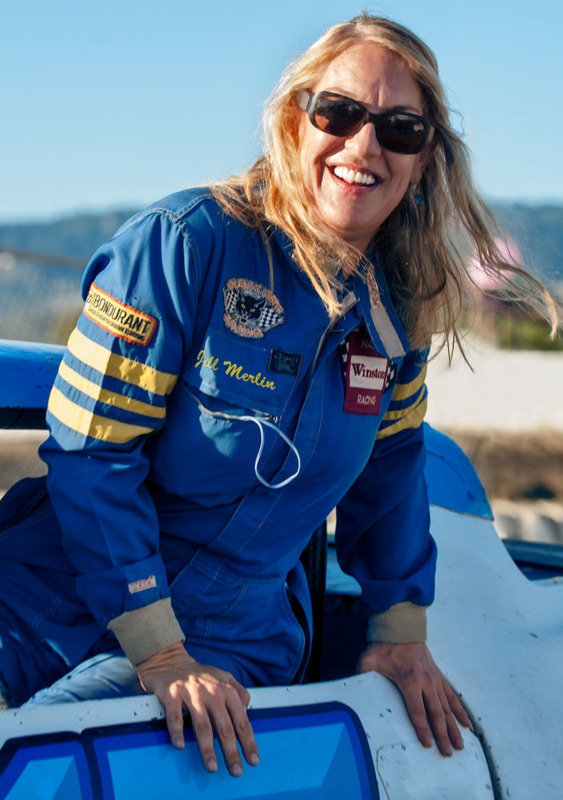 My invitation came from Jill Merlin, a project manager at Adobe Systems in San Jose who has been racing for years in the American Stocks class. As young girls, sisters Sonja and Jill got an early introduction to the sport watching their father racing on dirt tracks. Older sister Sonja went on to win rookie of the year honors in a late model modified car at the 3/8 mile Stockton 99 Speedway. These days, their father watches Jill race the car he built and maintains. That car is a 1970’s Pontiac Firebird that has been stripped of everything non-essential and reinforced with a full roll cage; doors are welded closed; and windshield replaced with heavy mesh wire (more on that later). Power comes from a crate 350 CID small-block V-8 motor. Like the other cars in this race class, the body has gotten pretty banged up after several seasons of wheel to wheel racing. My ride began by donning a one size too small Firesuit, fire-proof gloves and full-face helmet. Entering a car through the window takes some effort. With memories of Bo and Luke Duke leaping into the General Lee to guide me, I shimmied feet-first into my high-backed aluminum racing seat. Next, Jill helped me with the 5-point safety harness and then explained how to quickly free myself in the event of a roll-over. To say I was snug in there would be an understatement. Now I was really ready to hit the track. I’ve read that dirt track racing is the single most common form of auto racing in this country. The sport was created in the U.S. and goes all the way back to the 1920’ and ‘30’s. Ocean Speedway is like most tracks being that it’s an oval with a length between an 1/8 to a 1/2 mile long. It’s also partially banked. The track was completed back in 1960 and was an immediate hit -it was the place to gather on Friday nights. And based on my experience, Friday nights at Ocean Speedway are still as popular as ever. So there we were, strapped in and just waiting for the track to clear and the announcement for our cars to proceed to the dirt. And then it was our turn. Jill fired up that big V8. Lots of noise. No more talking. And off we were to line up and then be directed onto that wet dirt track. Wet? WTH? Keeping the track wet helps to reduce dust but mostly makes the track tacky. It also means the cars are always throwing up piles of chunky mud and rear ends are sliding out big-time in the curves. I dare say, it’s almost beautiful –like choreographed dancers. All those car, nose to tail and wheel to wheel, sliding sideways through the curves. Only the first place car is safe from the barrage of mud chunks thrown off by the cars in front of you. Because we weren’t in the lead, my face, body and camera were getting a generous coating of mud. Sometimes so much mud collects on the front mesh that the driver (or lucky passenger) will have to clear it with a poker stick. Anyway, all my great ideas for in car photography went out the window as the mud came flying through it. I could only laugh at the preposterous conditions that reduced my photographic effort to uncovering the lens for a few seconds and aiming the camera in a generally forward direction. But never mind the crazy photo conditions –I was having a freakin blast as we tore around that track. I think you could probably say that I had a mud eatin’ grin stuck on my face. And I gotta say, that Jill can really drive too. No fear, just pedal to the metal. Just an absolute thrill ride. My time in Jill’s car ended way too quickly. And while the racing season at Ocean Speedway comes to its conclusion October 10th, there’ll be plenty more racing in 2015. If you haven’t ever watched it, I highly recommend it. Just a whole lotta good ol’ fashion fun.